Spoiler alert - it's pretty damn cold outside. But, if you live in the Midwest, you already know that by now. It's gotten to the point that we're getting wind chill readings in the negatives and I'm secretly daydreaming about moving to Florida. Or California. Or the Mojave Desert. I'm getting way off track here. Anyway, it's friggin' cold and we're currently working on selling my car. Therefore, while my fiancee and I have schedules that often overlap, I sometimes have to walk back home from the office. At my previous employment, I had to work outside all day and no matter the weather, so I'm not complaining at all. After that, half an hour in the cold is a cake walk. However, sometimes I'm just not in the mood. 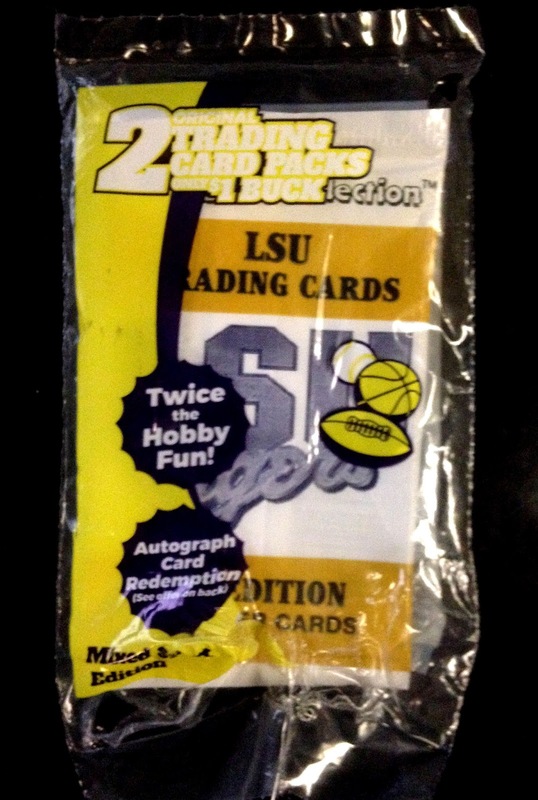 This is one of those countless repack products put out by Cards One. While I often bite on their multi-sport or baseball grab bags, I was swayed by this "two packs for a dollar" cellophane goody. 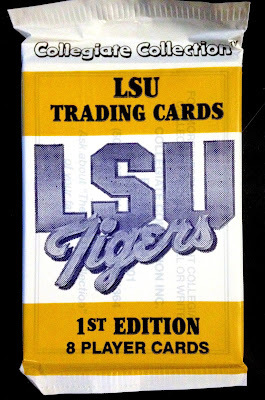 The reason this product caught my fancy on this chilly afternoon was two-fold: A) it's a re-pack type that I've only seen once before and novelty factor is always hard to beat; also, B) the LSU Tigers Collegiate Collection pack on top piqued my natural curiosity. In my opinion, minor league and college cards are quite fun to rip into; something about seeing Major Leaguers in unfamiliar uniforms with baby faces, before they were stars. Okay, I guess it could have been worse; at least it wasn't 1990 Donruss or 1991 Pro Set. That said, I truly have no use for swimwear model cards. I have no desire to ogle pictures of scantily clad women in trading card form - that's what Al Gore invented the internet for. Womp womp. Although, I'd be lying if I said that I didn't open the pack out of curiosity. Holy hypocrisy, Batman! 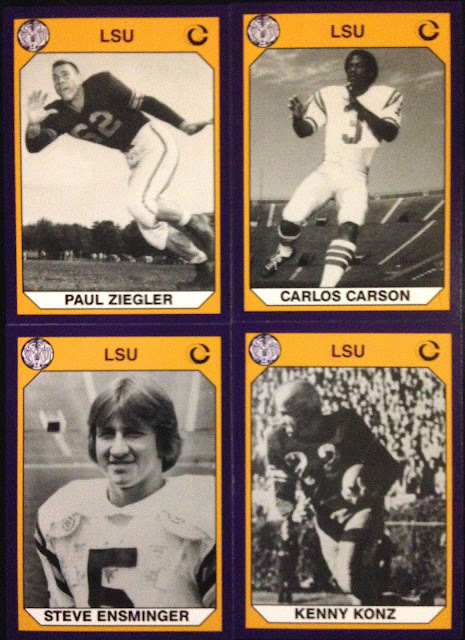 Meanwhile, back at the ranch, the main reason I bought this Cards One cello pack was for the LSU cards. I was hoping to land an obscure future Bear or Bull for my respective roster collections and maybe a track star for my burgeoning collection of runners. If you didn't already know, Collegiate Collection products were multi-sport, school centered sets put out back in the late 80's/early 90's. 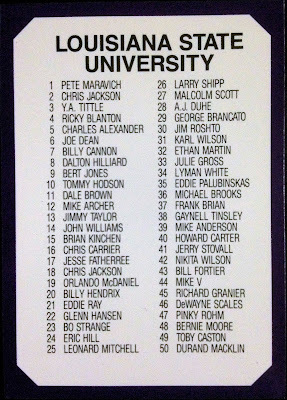 Lots of football here and not a single one of these LSU alumni went on to play for the Monsters of the Midway. 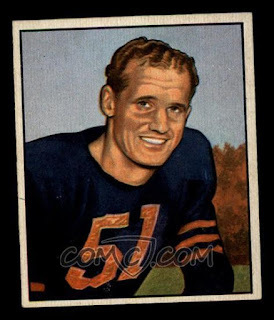 Ziegler and Ensminger made some token appearances in the National Football League, but Konz was twice an NFL Champion, a Pro Bowler and twice a First Team All Pro for the original Cleveland Browns as defensive back. Meanwhile, Carson, who wasn't even actively recruited going into college, grew into a two-time Pro Bowl wide receiver with a ten-year career at the sport's highest level. As for the set design, I always appreciate it when the design is color-coded with the depicted team. I also appreciate that the powers that be followed the KISS model - Keep It Simple Stupid. All of the CC sets from 1990 followed this same template. It's not the flashiest junk wax era set, but it gets the job done. Even more football here. Still no Bears. I don't like the way this is shaping up. to block for Barry Sanders, after having been twice named to the All SEC Team. Tragically, his life was cut short in 1991, after being struck by an out of control semi truck trailer in his own front yard. Yikes. 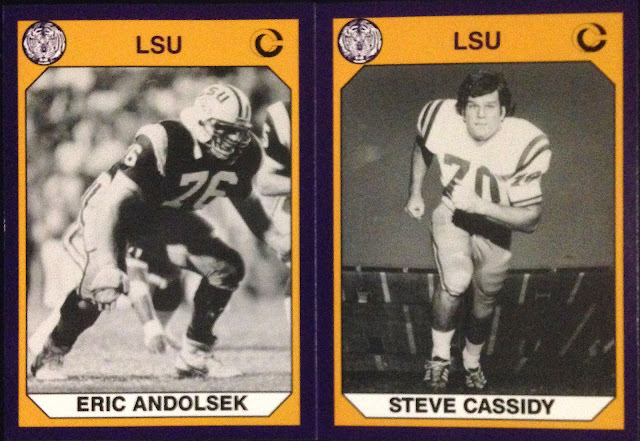 As for Steve Cassidy, he never did suit up in the NFL, though he did start every single game during his career at LSU. Alright! Some non-football stuff! 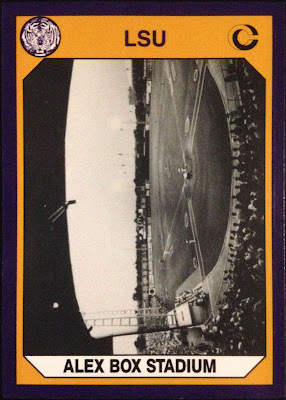 Although, the only baseball card was Alex Box Stadium and the only other card that didn't revolve around the gridiron was this checklist. Lame sauce. 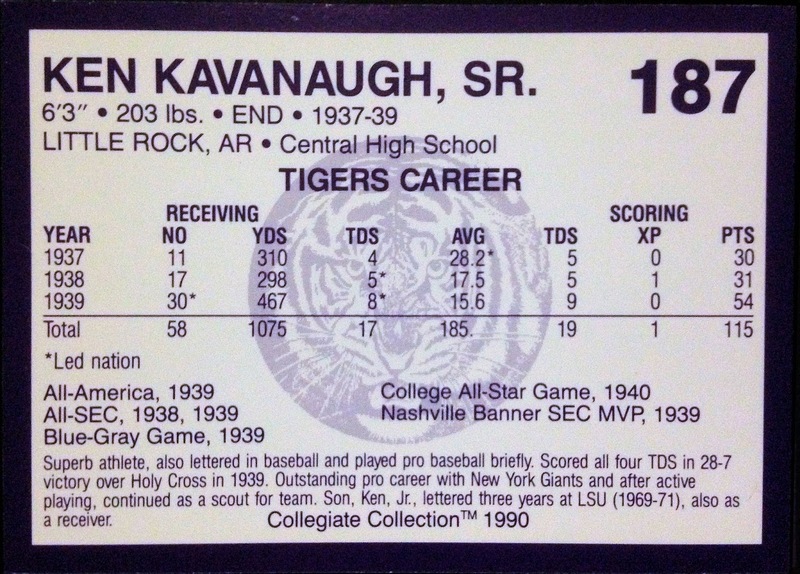 This card clearly features a photo of Mr. Kavanaugh after his playing career had been long over-with, collegiate and professional. The 6'3" wide receiver led the nation in touchdowns for two of his three seasons at LSU, leading to his being drafted by George Halas in the third round of the 1940 draft. As a Bear, Ken was a part of three NFL Championship teams (1940-46 & 46), was a three-time All Pro, and was named to the all-decade team for the 1940's. 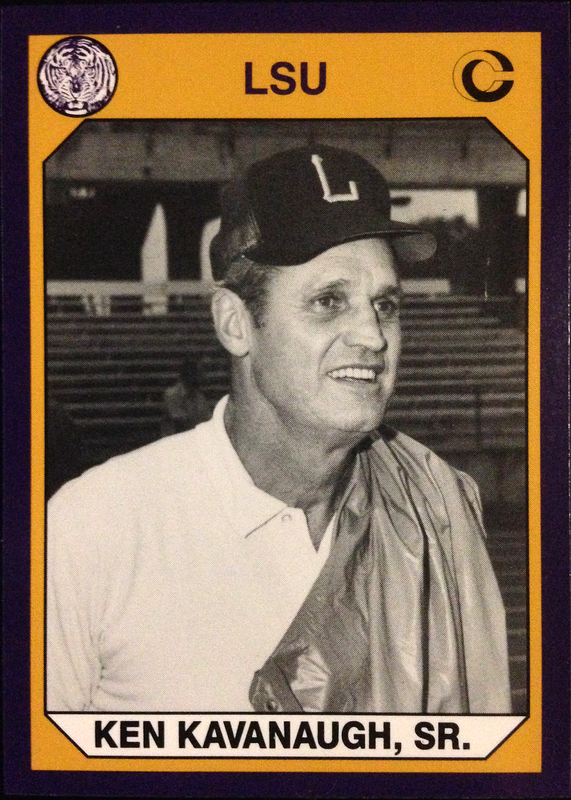 Oh, he also served as a pilot in the European theater in the middle of all of that and briefly played minor league baseball in the Cardinals organization. 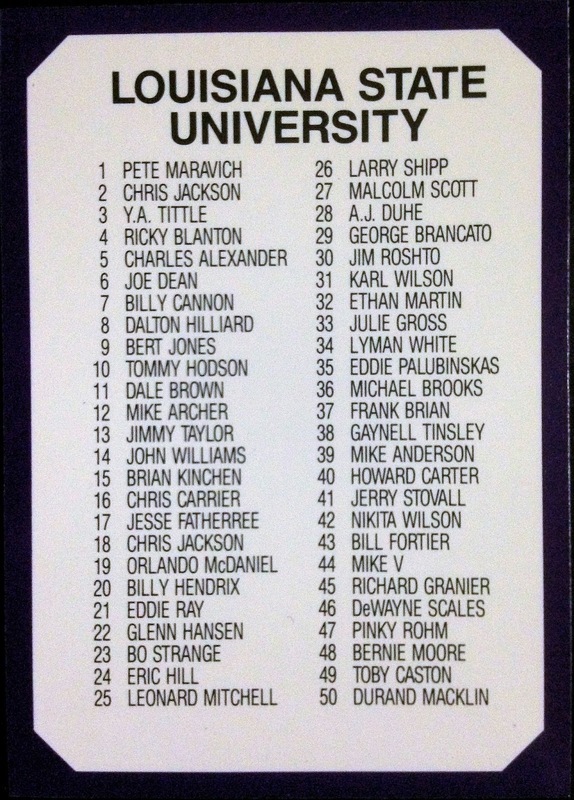 It's awfully hard to read that tiny, purple text, but I spy a "giant" error. According to the brief bio snippet, Ken's professional exploits came as a member of the Giants... even though every single game of his NFL career was played as a member of the Chicago Bears. Oopsy daisy! Although, Kavanaugh did spend most of his off-the-field life as a coach and a scout for New York; so, I can see why they might've made that mistake. Maybe someday. 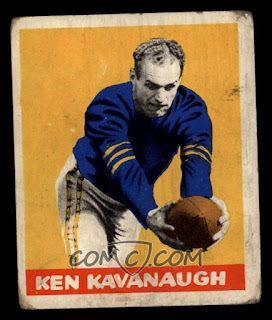 For now, I am more than content to use the purple and gold Kavanaugh to represent the franchise great. Not bad for an impulse buy that came about only because my extremities were more like icicles than fingers. I'm going to file this away as a win! See? There I go already. This could be a long winter for my fingers and my wallet! Maybe I just need to invest in some better gloves. Ummmm.....you forgot to post a pack. LOL@ and agree with JediJeff. 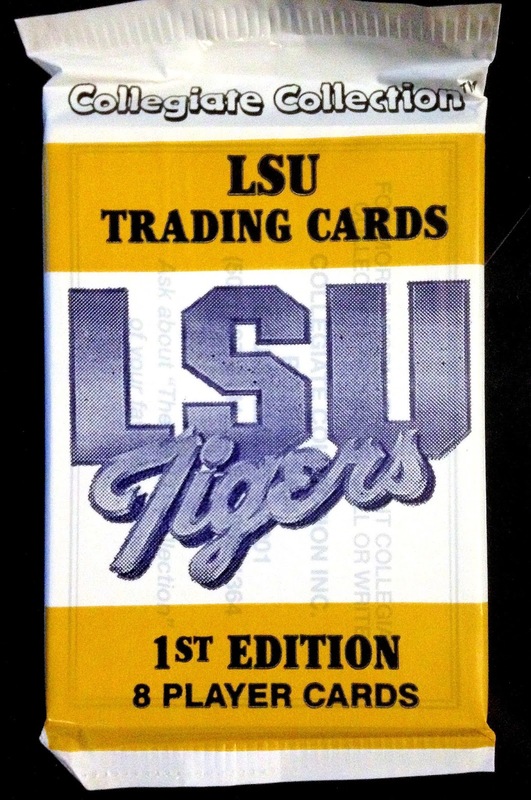 Mind trading that LSU Konz card? It jumped out at me even before you described his career below it.